Warship of Bangladesh Navy ‘BNS Dhaleshwari’ left Chittagong Naval jetty for India on Saturday to attend the 10th international naval exercise titled ‘MILAN- 2018’ scheduled to be held in Port Blair, capital of Andaman and Nicobar Islands. The exercise will start on March 6 and continue till March 13. 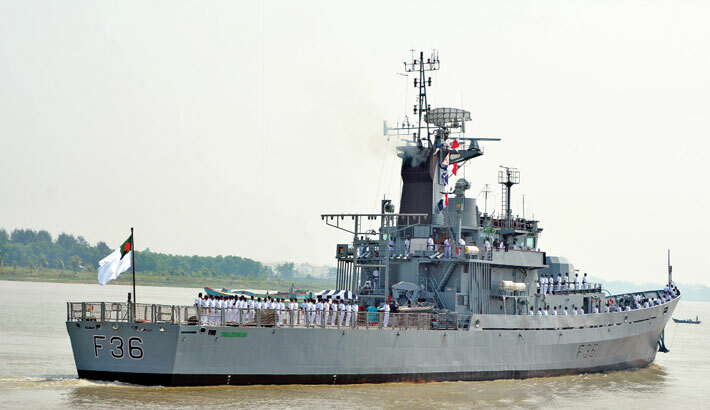 Prior to the departure from the jetty, Bangladesh Navy Fleet Commander Rear Admiral M Ashraful Haque and the senior naval officials gave farewell reception to the sailors of the ship. The ship led by its captain M Mohabbat Ali along with 157 navy officers, trainees and sailors left the jetty. Popularly known as MILAN, the gathering is a congregation of littoral Navies organised by the Indian Navy. With the theme ‘Friendship across the Seas’, MILAN- 2018 will see a diverse mix of professional exercises and seminars, social events and sporting fixtures. The interactions during MILAN encompass sharing of views and ideas on maritime good -order and enhancing regional cooperation for combating unlawful activities at sea.